When I saw organic yacon powder available at Indigo Herbs, I was intrigued. We grow yacon (Smallanthus sonchifolius) on our plot, but I’ve never come across it for sale in powder form before. It’s an amazing plant. CT has a particular fascination with the lost crops of the Incas and this is one of them. It’s a tall and majestic perennial in the daisy family and comes from the Andes in South America. It produces large edible white or purple tubers that are sweet and crisp. They can be cooked or eaten raw and taste a little bit like an apple. An alternative name for it is in fact, Peruvian ground apple. Yacon has various health benefits, but is particularly well regarded as a sweetener by diabetics; the human body doesn’t digest the sugars meaning it has pretty much zero calories. It also has prebiotic benefits, improving gut health and aiding digestion. The powder is made from yacon juice and tastes slightly fruity and quite caramely. It’s not as sweet as sugar, but is sweet enough to replace it in many instances. For my vegan Easter biscuits, I used it to reduce the sugar quite considerably, but I didn’t omit it all together. Indigo Herbs offers a huge range of interesting, healthy and high quality ingredients through their online store, most of which are organic. Their purple corn flour is also from Peru. Like any other corn flour, this can be used as a substitute or partial substitute for regular flour. It’s naturally gluten free. I used half of this mixed with half wholemeal spelt, so the gluten content of my vegan Easter biscuits is pretty low. Purple corn flour has higher antioxidant levels than blueberries. It’s said to boost the immune system and that regular consumption helps prevent diabetes and heart disease. As a replacement for the traditional butter in these vegan Easter biscuits I used coconut oil and a little raw almond butter. Almond butter makes most things better I reckon. This one is organic as well as raw and it worked wonderfully in the goji berry bliss balls I made last month. I didn’t have any mixed spice, so I used a little garam masala and a grating of nutmeg which did the trick. 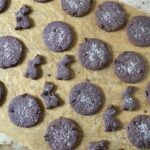 So, if you’re looking for a delicious crispy lightly spiced snack that’s healthier than most and only contains 33 calories per biscuit, why not try my healthier vegan Easter biscuits with purple corn flour & yacon powder? Crisp delicious Easter biscuits with a difference. These are lightly spiced, low in sugar, purple, packed full of nutrients and vegan. Beat the coconut oil, almond butter, yacon powder, sugar and spices together until smooth and well combined. Add the flour and currants and work in with a wooden spoon until you have a crumbly mixture. Add the water and stir with a round-bladed knife until well combined. Bring the mixture together with your hands to form a dough. Roll out to 6mm thick and stamp out into 6cm rounds. Bake in the middle of the oven at 180℃ for 10-12 minutes. Because of the colour, it's a bit difficult to tell when they are done, but they should still be purple rather than brown. Sprinkle over the remaining sugar and leave to cook for a couple of minutes, then turn out onto a wire rack to cool completely. The dough is a little crumbly, but it rolls fine if you don't mind a few cracks. It has a lovely short texture when finished. I’m sending these healthier vegan Easter biscuits off to Treat Petite with The Baking Explorer and Cakeyboi. This is a sponsored post in collaboration with Indigo Herbs. I was not expected to write a positive review and all opinions are, as always, my own. Thanks to my readers for supporting the brands and organisations that help to keep Tin and Thyme blythe and blogging. Wow how cool are these? I love hearing about ingredients like this and am impressed with how low calorie the cookies are too – hurrah! The trick is not to go and eat double the quantity – oops! They look lovely and are such a pretty colour. I had never heard of yacon powder until now but I’m going to find some. I love that it has zero calories and is so healthy. Your mix of flavours here is gorgeous. Garam masala in cookies is something I have never seen. I really want to try them. I need to find some yacon powder quick! Hehe, I like to surprise. Yacon is well worth searching out. You can get it as a syrup too, though I’ve never tried it. wow I have never heard of organic yacon powder before, I will have to get some for my dad as he is diabetic! Love that you keep introducing us to new ingredients. Thanks Pretty. Yacon is a particularly good sweetener, as I understand it, because it’s good for gut health as well. What an amazing colour! I did initially wonder if they were an April Fool made of Play-Doh. Hahaha, now that really would be a bit weird and very cruel to CT. Cool! I have never had or seen blue corn flour over here..wish I could taste some of your cookies. They look really inviting with that creamy purple colour. Thanks Angie. It’s a fun colour for a biscuit, but they taste really good too and I’m always happier eating sweet treats if I know I’m getting some good nutrients from them. You come across and use such unusual ingredients in your recipes. Love it! Thanks Michelle. A wide variety of good ingredients is the spice of life – maybe! I’ve used yacon powder in smoothies but I’ve never thought to bake with it – what a great idea! Years ago, one time when I moved to a new house, I was given some purple corn kernels by a native American friend of a friend. Apparently, among her tribe it was customary to give corn as a moving gift. I grew so much corn from those few seeds; some came out completely purple, and some were a mix of jewel colours. All were utterly delicious. My next door neighbour, who had never seen corn growing before, was convinced I was growing illegal drugs! Ha ha! I love the colour of your cookies, and that they are spicy. Definitely my kind of treat! I’ve not tried yacon powder in smoothies, but now you come to mention it, I really should try a yacon tuber – can’t believe I’ve not thought of that before! Lovely story about your corn. We’ve grown purple corn in the past too. Would love to do so again. Living with CT, I’ve become used to all sorts of weird and wonderful ingredients. Some of which have subsequently become quite popular. 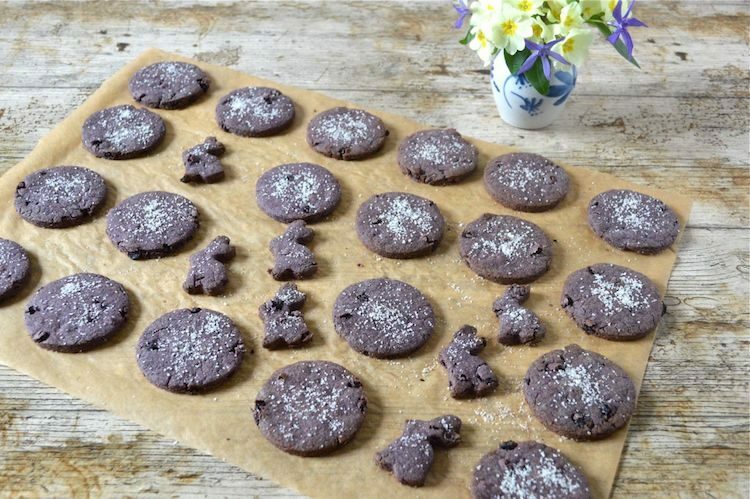 The purple flour makes the biscuits look so pretty – I am intrigued by the idea of yacon powder. These are so clever, I would never have guessed what made them purple. Happy Easter. Thanks Janice. It’s a cool kind of flour to use. Happy Easter to you too. Never used yacon powder but have used the syrup form. We grew yacon ourselves in the allotment a couple of years ago but an lot of cost / effort for so few tubers. Subtle but tasty, at least. Love that purple corn powder too! We keep our yacon in a perennial patch, so find the effort very small. But it’s one of CT’s crops, so I don’t really have much to do with it. This yacon powder was the first commercial yacon product I’ve come across. We’ve been growing them for year, but don’t harvest them nearly as often as we should. Healthy treacle does sound rather good. I love making bakes colourful whenever I can do it naturally, so this corn flour is just brilliant. I wish you and yours a very colourful Easter. The purple corn flour would be excellent of you to have a play around with Kate as it’s naturally gluten free.